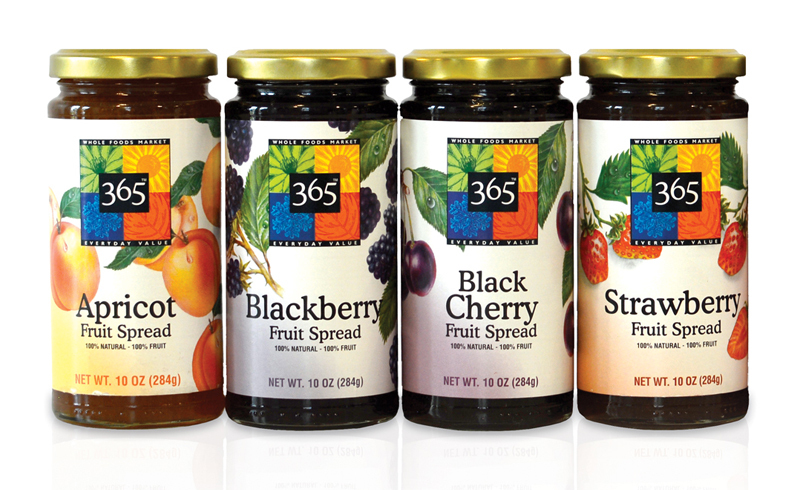 We designed the 365 brand logo and packaging for Whole Foods Market in 1998. 365 was an instant success with customers and helped fuel Whole Foods growth into a national chain. 365 has become so trusted and popular that Whole Foods co-opted the branding for its new store concept, 365 by Whole Foods Market, a new “smaller-store format” intended to target Millennials and compete with Trader Joes. Supermarket News has reported that 365 sales through Amazon.com totaled $10 million in just three months, averaging weekly sales gains of 9%. The 365 Everyday Value brand was consistently the No. 2 performer in sales volume behind Amazon’s main private label, AmazonBasics, during the short time it was available, and was the fourth most popular brand for the full year. The success of the 365 Everyday Value line has eroded sales of Amazon’s other grocery brands, including Happy Belly and Wickedly Prime. Happy Belly, for example, was Amazon’s leading brand of trail mix at the end of the third quarter, but the brand was discontinued for trail mix in early October. “We can pretty much guarantee that this is going to be a huge brand on Amazon in 2018,” said Spencer Millerberg, CEO at Salt Lake City-based One Click Retail. If you’re aiming for a WOW call us.